Cold winter nights mean hearty soups in my kitchen. 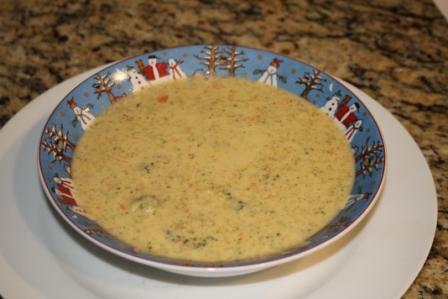 Broccoli Cheddar Soup is always a favorite when dining out but I’ve rarely made it. This is a great recipe that has become a family favorite. Add the garlic and cook about 30 seconds, stirring constantly so it doesn’t burn. Remove from heat and set pan aside. In a large heavy-bottom pot, add 4 tablespoons butter, flour, and cook over medium heat for about 3 to 5 minutes, whisking constantly, until flour is thickened. You are making a roux and it’s very important the mixture is thick or soup will never thicken properly later. Slowly add the vegetable stock, whisking constantly. Slowly add the half-and-half, whisking constantly. Allow mixture to simmer over low heat for about 15 to 20 minutes, or until it has reduced and thickened some. Whisk intermittently to re-incorporate the ‘skin’ that inevitably forms, this is normal. While mixture is simmering, chop the broccoli and carrots. After simmering 15 to 20 minutes, add the broccoli, carrots, and the onion and garlic you previously set aside. Add the salt, pepper, optional paprika, optional dry mustard powder, and optional cayenne. Stir to combine. Optional: I used a Braun hand blender to blend the vegetables into a creamier consistency. While soup simmers, grate the cheese. After simmering about 20 to 25 minutes, add most of the cheese, reserving a small amount for garnishing bowls. Stir in the cheese until melted and incorporated fully, less than 1 minute. Transfer soup to bowls, garnish with reserved cheese, and serve immediately. Soup will keep airtight for 5 to 7 days in the fridge. Reheat gently in the microwave.